The ADO buses in Mexico are always freezing, the drivers really crank up the A/C, so I did the 3 hour journey from Tulum to Chetumel in trousers and a hoodie. The downfall is that you are sweating to death when you get off the bus. It was such an odd feeling to be wearing so much clothing again after weeks of bikinis and shorts. The bus ride was enjoyable and I got to watch "Slum dog Millionaire" and an episode of "Deadliest Catch" in Spanish, which was the first TV I had watched since I started travelling. The scenery was just mile after mile of jungle, with a few hut style houses dotted along the way. It's amazing that soo many people here live in tiny huts made of palm leaves and most of their furniture seems to be plastic patio furniture and hammocks. Tons of women, spend all day selling pineapples and mangos at the side of the road in the scorching sun. Makes me glad I'm not Mexican! Chetumel, meaning "Place of Red Wood" is as boring as it sounds and pretty grim. It's an urban area that doesn't feel very safe at night or even during the day for that matter. All the locals stare at you when you walk by, as if they've never seen a white person before and the men are very leary. It's really just a stop gap for people going to Belize. Not realising this until it was too late; I got to spend 3 long days here. Lucky me! My first day in Chetumel was spent walking for over 6 hours, in search of another power cord for my laptop. Along the way I realised all the houses in Chetumel seem to be built in the style of "The Larch" in Moodiesburn. Small, flat buildings with bars on every door and window. Very charming! After a 3 hour walk to the local Wal-Mart, I find that the only power cord they sell is "out of stock". Luckily, I met this really nice, older American man, who I got chatting to and he gave me directions to the nearest shopping mall. We ended up talking for about 40min and he introduced me to his latest wife (wife No 3). Wife No. 2 was from Quebec, so we chatted about Canada for a bit and he recommended some places for me to visit on my travels. After that I headed off to continue my search. After 5 min walking the American man and wife No. 3 pull up and advise me the mall is actually 4k away and they offer me a lift. Usually I wouldn't take a lift with someone I didn't know, "Stranger Danger" and all that, but I had already been walking for 3 hours, it was really hot and I had a good feeling these two were not serial killers, so I took my chances and jumped in. Turns out I'm a pretty good judge of character cause I'm still alive! The walk back took ages because I only had half a map of the town, so had to guess some of way, which probably extended my journey by quite a bit. Long story short, it took a total of 6 hours, but I finally got a new cord. After that I decided I wasn't leaving the hostel again until it was time to leave for Belize. There was nothing to see or do in this town and I was getting really annoyed with the taxi drivers in Mexico. For some reason they constantly beep at you to see if you want a lift. Sure that doesn't sound too bad, but if there's 4 taxis, one after the other, they will all beep at you. Even if they see you say "No" to the first driver, they still continue to beep, one after the other and it gets really old, really fast! Anyways, this little visit to s***ville was saved by the lovely Vancouver couple that was staying at my hostel. We had dinner and drinks together on the patio most nights and they were just really nice, genuine people. I'm starting to realise that it's the people you meet along the way that really makes the experience worthwhile. This is also where I met Alfonso from Mexicali. Little did I know he would end up being a reoccurring character in my journey. Finally, my departure day arrives and I head to the port. Unfortunately, my taxi driver didn't understand me and I ended up at the airport. This taxi driver was also very creepy and asked if he could take a picture of me with his cell phone. Obviously I said no, god only knows what your face would end up on. It was all very weird and I was happy when we finally arrived at the Port. The port was actually really nice in contrast to the rest of Chetumel. However, the port authority guys soon rocked up in full camouflage with a whole artillery of automatic weapons and sniffer dogs. 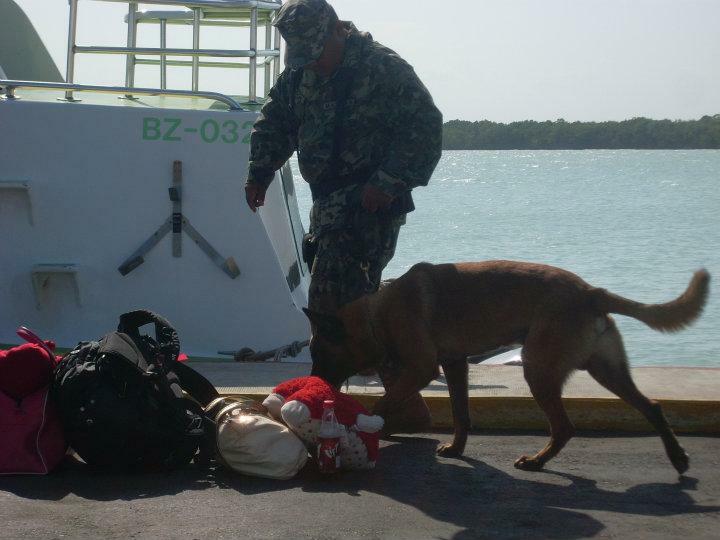 Before we could board the boat to Belize they lined us all up with our bags and the dogs got to work. Luckily, we all passed inspection and were cleared to board. So off I went, on my way to Caye Caulker, Belize. Note to self...Never go back to Chetumel!